Nick’s Beatle Boot – All colours available in leather or suede. Fully leather lined. Zipper up rear seam or elasticized side panels. 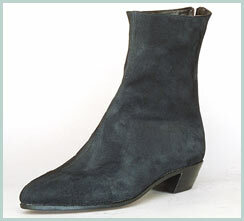 Leather sole with Cuban heel (as per photo). Priced from $425 Cdn. This entry was posted in Mens Boots. Bookmark the permalink. Both comments and trackbacks are currently closed.